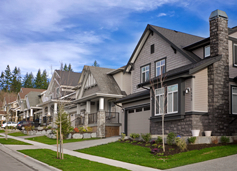 The development on Burke Mountain, Coquitlam, has seen a shift towards higher density housing in the past 6 months, and Tyneridge Townhomes by Polygon Homes is continuing that trend. This new development is situated atop a hillside, providing spectacular views of Mount Baker and a sweeping panorama of Vancouver. The location of these townhomes is perfect - surrounded by upscale single-family homes, and with a new school scheduled for development right across the street. You are certain to retain a lot of value in these townhomes, and Polygon's reputation for building quality homes only adds to the desireability of this development. Tyneridge Townhomes will feature 2 different three-bedroom floorplans (and a single 4-bedroom end-unit) with spacious layouts designed for young families - which certainly suits the neighbourhood. Both flooplans feature an open concept kitchen/living/dining area, with the larger model adding a powder room on the main floor. The decent-sized patio is off the main level, and the standard features in these townhomes are a little more upscale than you'll see in many similar developments. Each townhome will also have its own private yard and patio, and the attached 2-car tandem garage is a nice bonus. Most of the larger units in Phase I were sold on the first weekend of sales. Polygon has done a great job with these, and it should set the standard for quality multi-family development in the Burke Mountain area. Tyneridge Townhomes by Polygon Homes is now SOLD OUT. Contact Rebecca for information about resale townhomes in this development.